VOTE FOR THE BEST IRON COSPLAY FOR YOUR CHANCE TO WIN! 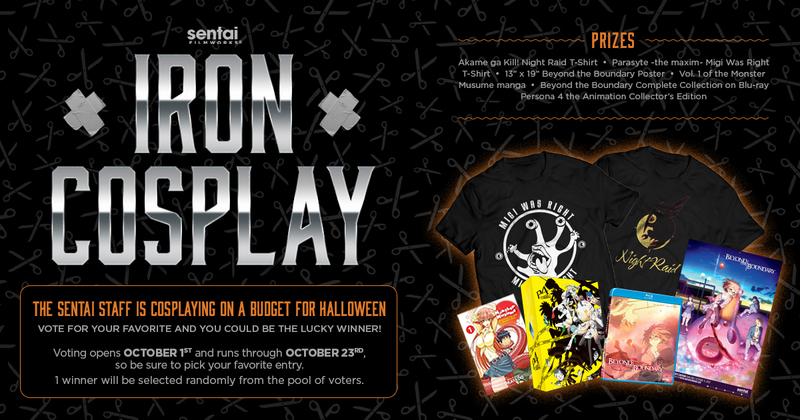 Halloween is fast approaching, and we here at Sentai Filmworks are getting into the season with a cosplay contest. In the interest of keeping things entertaining, however, this will be an Iron Cosplay competition! For those of you unfamiliar with the term, Iron Cosplay refers to a contest where cosplayers construct their costume with limited materials and/or a low budget! In this case, our office worker contestants have $20 and whatever casual clothes they already have in their closet to make the best costume they possibly can! The voting period is October 1 – 23, 2015. Be sure to vote daily to increase your (and your favorite contestant’s) chances of winning!